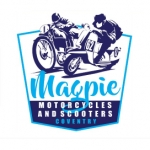 A lifetime of passion for vintage motorcycles and scooters has lead to the creation of this business Magpie here in Coventry. We are able to offer a high quality service/repairs and restorations of your classic scooter to original factory specifications or something bespoke for that little bit of difference. Along with our fully equipped workshop we also provide an on-site MOT Testing Station on all makes and models of motorcycles and scooters.